Of all English qualified T20 stars, nobody is more of a winner than Luke Wood - according to the internationally recognised T20 Player Index. The Index, which bases its information on a rolling three-year period, shows that the left-arm paceman has been on the winning side in 71.4% of his 21 matches. He won the Blast with Notts Outlaws in 2017, and was triumphant at Finals Day again the following September whilst on loan at Worcestershire. Four of the top six players in the win percentage standings play for the Outlaws, with Jake Ball (66.7%), Steven Mullaney (63.6%) and Harry Gurney (62.8%) each joining Wood in the upper echelons. Tom Moores (59.5) and Alex Hales (57.4%) also feature in the top 20. 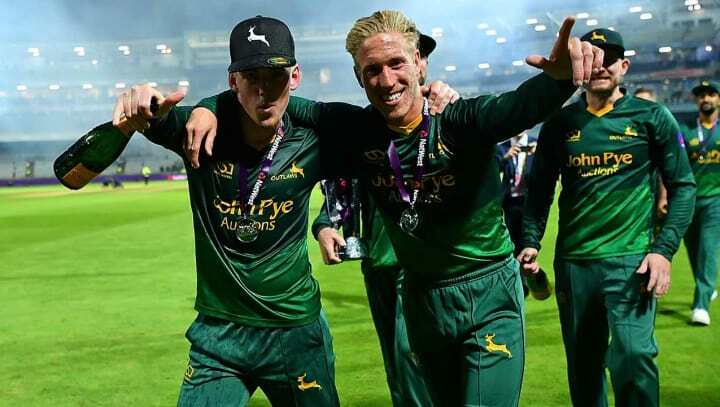 Wood, a graduate of the Nottinghamshire Academy, took eight wickets and sustained an economy-rate of 8.06 during the 2018 tournament on-loan with the West Midlands county. The irony of the Outlaws being paired with the Rapids in the opening game of the 2019 tournament isn’t lost on the 23-year-old. “I had a little smile to myself when I saw the fixtures. Myself and Joe Clarke could both be in the Notts side, which will feel a bit strange after what we did last year. Players are given a world ranking, with former Outlaw Andre Russell currently topping the table - albeit his win percentage of 60.8% is below that of Wood, Ball, Mullaney and Gurney. Among current Outlaws, Dan Christian holds the highest ranking in 31st position.